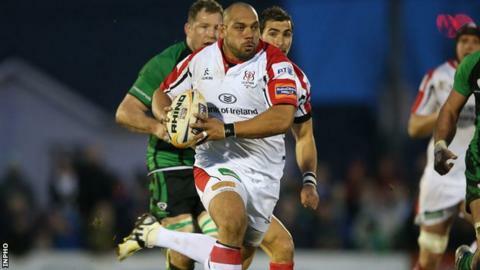 New Zealand tight-head prop John Afoa is to leave Ulster at the end of the season after agreeing a long-term deal with an English Premiership club. The 30-year-old joined Ulster more than two years ago from the Auckland Blues and has made 48 appearances to date. "It's good to have my long-term future sorted out, but I still have a lot of rugby to play with Ulster," said Afoa. "When I finish my career, I will reflect on my time at Ravenhill with a lot of pride," added the Kiwi forward. "I have six months remaining on my contract with the province and I am focused on helping the guys win something this season." Afoa made his debut against Connacht in the Pro12 in November 2011 after being part of the All Blacks' World Cup winning squad. He has been an integral part of the squad since then, although injuries and his family situation have limited his appearances of late. Ulster director of rugby David Humphreys said that Afoa "has made a fantastic contribution to Ulster Rugby in the two years that he has been here". "He has been excellent for us on the pitch but has also been great for us off it, working along with Allen Clarke to develop the next generation of props for Ulster and Ireland," he added. "I know that with his wife and children in New Zealand, it has been a challenge for John to balance the needs of rugby and family, but he has handled that situation with the utmost professionalism. "When he leaves in June, everyone at Ulster Rugby will wish John well. Until that time however, I know that he will be fully committed to the province and I also know that he will now be even more determined to help Ulster be successful this season." Last month, another Ulster prop, Tom Court, revealed that he would be leaving to join London Irish at the end of the present campaign.